The medal ceremonies at this year's Olympics were full of the regular pomp and circumstance except for one notable exception: flowers were no longer part of it. 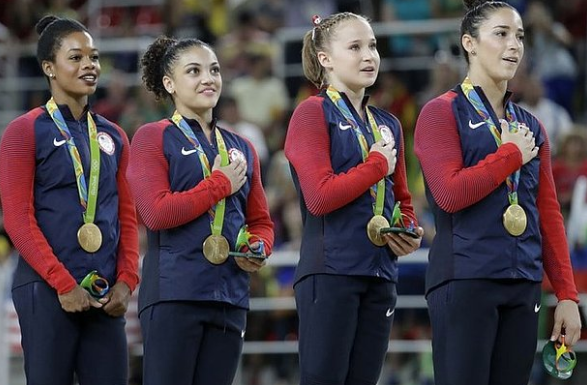 The absence of the flowers has left viewers confused and wondering why Olympic medalists were receiving a paperweight instead. The short answer? Sustainability. The 2016 Olympics' main theme this year was sustainability, with the majority of the torch relay focusing on stories around it. It's also why flowers were done away with this year, since it's not a gift most athletes treasure anyway. "We give it to an athlete, and very often they just throw it away," said Christy Nicolay, the executive producer of the victory ceremonies to The New York Times. Instead, the winners received a sculpture of the Rio Olympics logo. The logo, designed by Fred Gelli and his design studio, Tátil, "shows three figures joining hands and feet," reports Curbed. It was designed as a 3D-model, making it easy to turn it into a sculpture for athletes. It's not yet clear what the next Olympics might have for athletes in lieu of flowers.